But mostly I've been inside where it's a bit cooler. 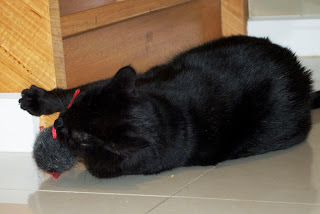 Mr Mouse has still not been behaving that well so I've had to teach him a few lessons. Hopefully he will learn something useful soon! Mum and I have signed up for the Idita-Walk 2009, with some of the SMS mums and pups. She says she will be getting me my very own Huffle harness so we can go on walks together. I am not sure how I feel about this yet. The idea is: An event to promote physical fitness in the spirit of the Iditarod Sled Dog Race. The Iditarod Sled dog race is 1049 miles long from Anchorage to Nome, Alaska. To complete the Idita-walk, walk 30 minutes a day for 35 days between February 1, 2009 to March 31, 2009 for a total of 1049 minutes. Today's question comes from Princess Eva and her brother Brice. 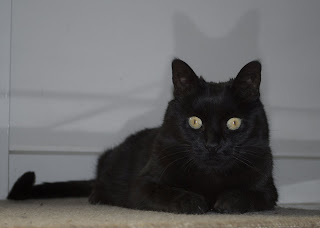 They asked me: did I ever share the story of how I found my treat dispensers? (Otherwise known as mum and dad). I think I may have covered this story once before, briefly, but here is the whole version. 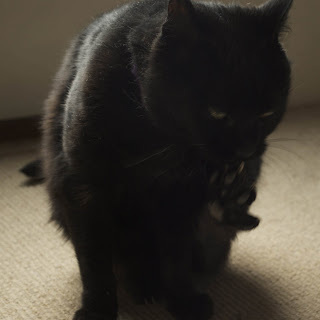 For Christmas 2005, mum decided to get dad a kitten for his present. He had been talking about getting another cat (to keep poo-face Salvador company, but we all know how that turned out) for a long time so she decided to surprise him. Only she had to tell him, so he could pick out the kitten for himself. So on 28 December 2005, mum and dad set off in the car to visit the Cat Protection Society. They were going to get a little kitten but the lady there said they had a lot of grown up cats looking for a home too. So dad decided to look in the grown up cat area. They saw another grey kitty who looked nice but some people had already decided to adopt him. 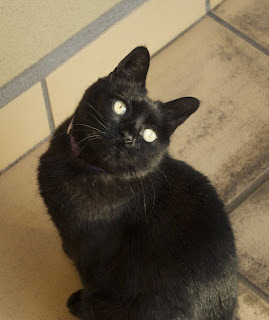 Mum and dad spent ages in the cat pens playing with all the kitties and patting them, trying to find just the right one. Eventually they narrowed it down to two cats - me and another kitty who looked a lot like poo-face Salvador. When they went inside to talk to the lady, she had to know what numbers we had on our tags to give mum and dad all our information (how old we were, whether we were boys or girls, how long we had been there, etc). Dad went back out to find the other kitty's tag and the kitty bit dad on the hand! 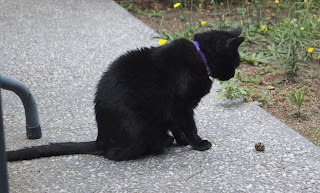 So he decided to not even bother with that other kitty; they decided then and there that I was the kitty for them and we all went home together. I knew if I was good I could choose them for myself, and it all worked out nicely. Thanks for the question, Eva and Brice! If anyone has more questions for me, feel free to ask any time! I have some more question to answer over the next few weeks from friends who have already asked me important questions... stay tuned. At first, I was going to complain to the pupparazzi that they should not be showing me in an indelicate pose like this. 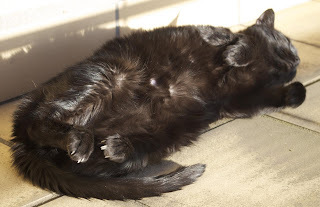 But then I figured, it shows my flexible side, and shows the modelling agencies how pretty my feets are. Notice also that my paw pads are black like the rest of me. Black is the new black, you know. My friend Khyra sent in a question for me to answer. Khyra asked: Have woo ever tried on any of your mum's shoes when she wasn't home? For those of you who don't know, my mum has a bit of a shoe addiction and she currently owns 93 pairs of shoes. We're getting an intervention organised for next week. Anyway, the answer to Khyra's question is... I'm not telling. But I will show you this photo and you can decide for yourself whether I have tried on mum's shoes or not. Thanks for asking me a question Khyra! Oh, and Brownie asked me a question too: he wants to know if I will accept questions from hamsters. Of course! All questions are accepted here at Ask Huffle! 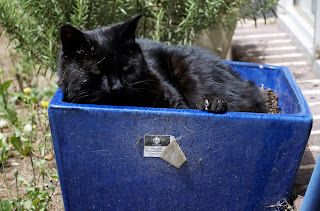 I'm very excited to report that Cats with Blogs has 31 members after just one month in existence! This is very good! But kitties, did you know that our sister site Dogs with Blogs has 1,000 members? Yes, that's ONE THOUSAND dog blogging members. Surely we can beat that. Every kitty in the whole world needs to join Cats with Blogs! Welcome to the very first edition of Ask Huffle. I had some very good questions over the weekend and I will be answering them all over the next few days. This question from my best friend Zim of the Army of Four was not the first question I was asked, but it relates to today's date so I thought I better answer this one first. Zim asked me: Australia Day is coming up. What are your plans to celebrate? Is it traditional to eat ham? 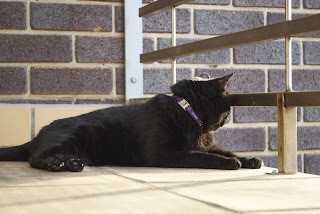 Well Zim, today is Australia Day and I am very sad to report a distinct lack of ham in the house. Mum even went shopping yesterday and everything. I plan to celebrate the rest of the day by having my mid morning nap, my late morning nap, my after-lunch nap, my afternoon nap, my pre-bedtime nap and then going to bed. I might squeeze in a play session with my mouses as well, but I can't promise that one. I have heard that the tradition for Australia Day is to have a barbecue and drink some beer. But we don't have a barbecue, and only dad drinks beer in my house so we probably won't do either of those. The city puts on a fireworks show but I don't care for those either. You could say Australia Day is a lot like any other day in my life! and then the fifth photo. 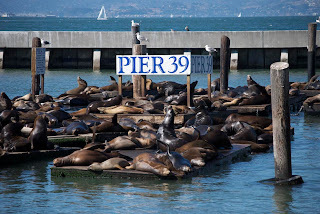 These are the sea lions that have taken up residence at Pier 39 in San Francisco. They arrived there after a small earthquake a few years ago, and have never left. The city lets them stay too. If you click on the picture you can see a bigger version. 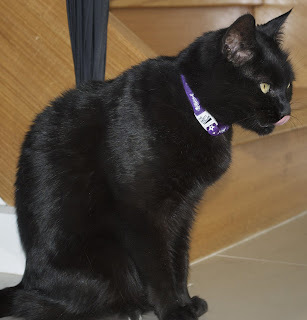 Only because I'm a black cat, I'm not going to tell them, they're gonna have to read my blog to find out they've been tagged! I am going to start a new feature on my blog. It's called Ask Huffle. Any pup or kitty can ask me a question and I will answer it very carefully. I'm even willing to do some research to find out the answers to any questions you all have. I'll feature a new question every few days, so start asking! You can leave a comment with your question, or you can email me. You can ask any sort of question you like, except something that might make MrSippi blush. Did you know that if a man comes and pulls out a piece of wood from somewhere inside the house, then goes to a shop and buys another piece of wood and then cuts that new piece of wood with a saw to be the same size and shape as the old piece of wood, that this cutting creates something called sawdust and you can roll in it and make pretty patterns! And, you can even decorate your furs with it! For some reason, your mum will not think this is a good thing. I don't know why. I have been thinking about my tactics with the pupparazzi. Poking my tongue out at them is not working, as you can see by the plethora of tongue-poking-out photos that have been published on my blog. Mr Mouse is letting the team down too. He was at school earlier this week but I don't know if anything sunk in or not. Time will tell. I may have to come up with a new plan. I wonder if this would make a good toy? Things are getting desperate if I have to find dead bits of tree in the backyard to play with. Well, for Mr Mouse anyway. He has been very naughty lately and keeps running away when the pupparazzi follow me. So he is at school today, learning his lesson. Since it's Sunday already, I am just hanging out and having a few naps. It's the best way to spend a Sunday, really. You don't want to over-exert yourself. Thankyou to everyone who voted in my poll this week. I asked you if you thought I should post every day in 2009. Well, 76% of you said yes, the rest said no. But those of you who said no, left comments indicating that it wasn't that you didn't want me to post every day, but that I shouldn't feel any pressure to post every day. Thank you all for being so thoughtful! The upshot is, I will attempt to post every day (I do enjoy it) but sometimes there are days when even I don't have anything to say, and who knows if mum and dad will leave me alone for a whole month again this year! I might not post on those days. All this thinking is making me tired. I'm going to have a nap now. What's that behind you mum? These are some of my mouses. I think both of them came from Charlie and Opy's mum and dad! 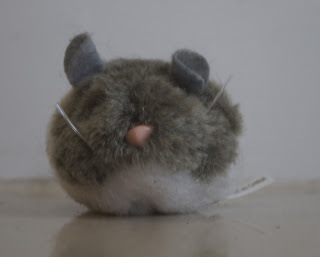 I don't know what has gotten into MrMouse lately - every time the pupparazzi come around he is nowhere to be seen! He is not being a very good bodyguard and I am a bit worried. Do you think he is being paid by the pupparazzi? The other day I was out on my balcony. Just watching the world go by. A cat has to snoopervise sometimes, you know. Nothing very exciting was happening in my street, although there were some noisy kids out there. They went away after a while though. This is my supermodel pose. What do you think? I have almost given up running away from the flashy beast. Mum just follows me anyway. Mum has recovered from her selfishgraine and says thankyou to everyone for keeping quiet yesterday. She spent most of Sunday in bed and yesterday still didn't feel too good. I had to nap out of sympathy. Mum had a migraine yesterday so we're being very quiet and sleeping today. I hope every pup and kitty had a nice weekend. 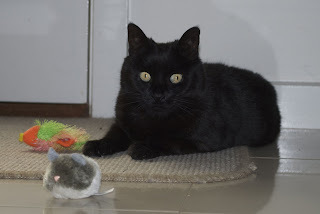 My very good friend Miss Fluffy Tail has given me an award! 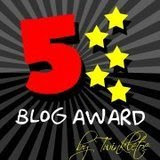 It's the Five Star Blog Award. Thanks Khyra! Since it's Saturday already, and mum has gone out with some of her friends, I'll be sleeping in and maybe checking on my parsley. I hope every pup and kitty has a lovely weekend! I have a poll for everyone to vote in. It's very simple, there are only two answers, yes or no. What I want to know is: should I aim for posting 365 days this year? Please vote in my poll on the sidebar; it closes next Friday. I will continue to post every day until then, just in case you all say yes! As you can see from this photo, my back yard is not very impressive. Really, it looks like a wasteland. Our next door neighbours have these trees that lose all their dead leaves into our yard. It makes a nice soft spot for me to sit on, but then mum gets annoyed if I accidentally bring some into the house. I don't know why, I'm just helping her decorate. This one is specially for my darling MrSippi. 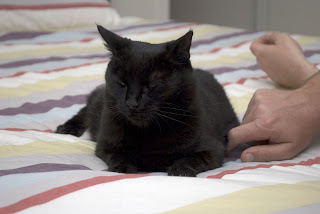 The other day, I was having my pre-bedtime nap, when dad came upstairs to annoy me. I ask you - is this the face of a happy Huffle?? 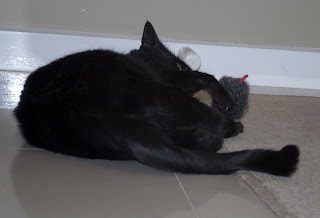 This is the new mouse that Charlie and Opy's mum and dad brought me on the weekend. Isn't he cool? He has this string that you pull and he runs around - it makes it even more fun to chase! upside down, behind the coat rack in our lounge! How do you suppose he got like that? 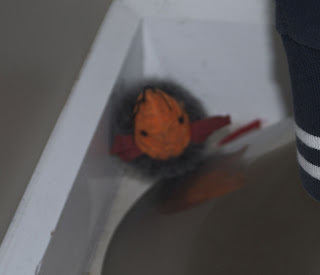 Do you think the evil squirrels infiltrated our house and attacked Mr Mouse? Last night, Charlie and Opy's mum and dad came for dinner. They are very good dinner guests; they remembered to bring me a present! I got a new mouse and some Temptations. Very tasty - thanks Charlie and Opy's mum and dad! Anyway it was a late night last night, so we have been sleeping in today. I managed to escape out the garage door and lie on the front porch for a change. Mum caught me, took this photo, then shooed me back inside. 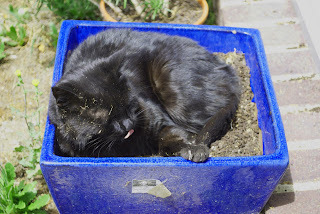 Sometimes, when your mum and dad are really bad at gardening, you have to take matters into your own paws. That's exactly what I've done here; I'm giving mum's parsley my own special brand of Huffle help. 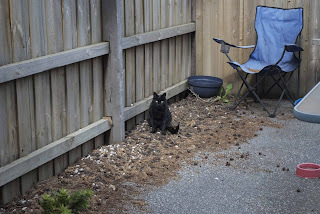 This is also a good place for a nap - the dirt is all nice and warm on my furs. I know that all of you know how much I love ham. I would like to explain something about my addiction to ham though. 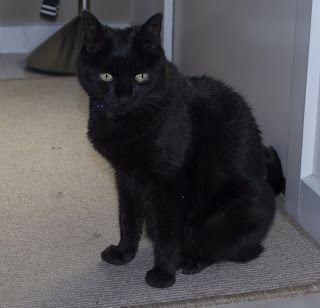 Mum is very careful about how much she feeds me, as foods that are high in fat content, like ham (even though mum buys the really good stuff that doesn't have a lot of fat), are not always good for kitties and pups. My BFF Tia had pancreatitis and is not allowed to eat ham or other foods that are high in fact any more. A little while back I even gave up ham out of solidarity with Tia. So even though I talk about ham a lot, I don't really get as much to eat as I would like. This has been a Huffle Mawson community service announcement. In honour of my friend Fin's birthday, we are playing a new game where you post baby pictures of yourself. Now I don't have any of those because I arrived here when I was already five years old, so I am going to show you a baby picture of my Uncle Buckley. This is from his first day at home with my grandpa. 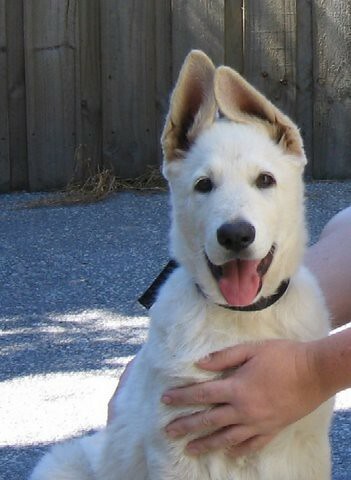 He is three months old in this picture. Wasn't he adorable? This is my first post for 2009! Probably one of the first pup or kitty posts for 2009! How exciting. 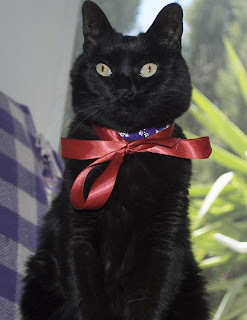 I'd like to wish ALL my friends a happy new year, I'm celebrating the first day of the year with my red ribbon from Christmas (I don't know how mum convinced me to wear it again) and there will definitely be ham later. Happy new year everypup and everykitty! Today is also my friend Fin's birthday, so happy birthday Fin!